It’s official – Florrie Smith of Portsmouth, aged 17, has been crowned ‘Young Budding Baker Of The Year‘ and received a winner’s welcome at Warrens Bakery in St Just, Cornwall. 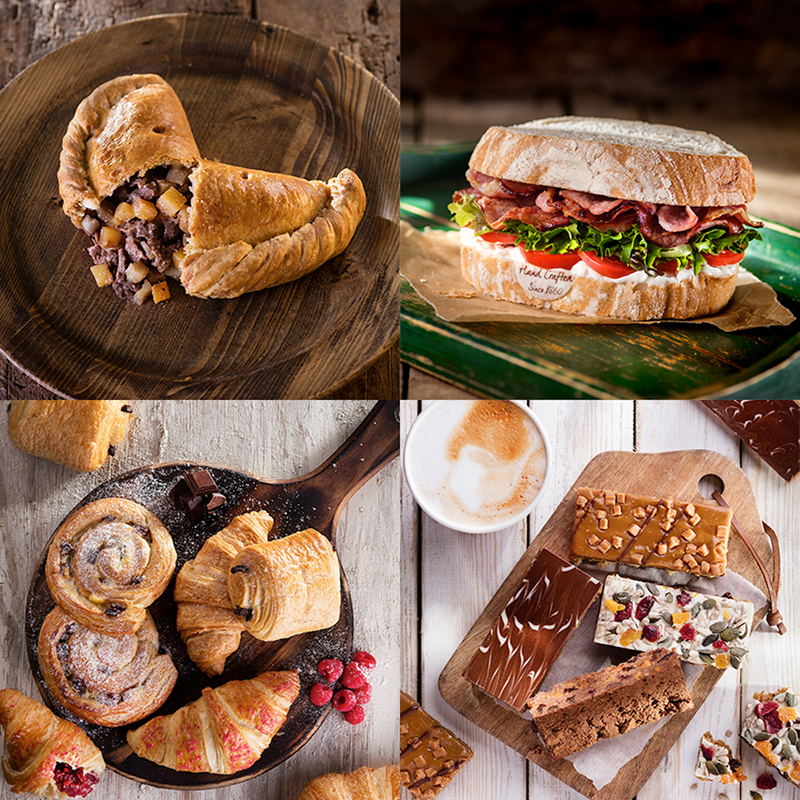 This is the first time that Warrens Bakery – founded in 1860 and the oldest bakery in Cornwall – has run the competition, open to 16-18 year olds. Warrens now has 70 stores across the country – part of a rapid programme of expansion – and nominations poured in by the thousand from the seven regions where stores are now located. Florrie fought off stiff competition to take the title, the finals of which were held in Bristol in August. Seven youngsters were invited to attend a day of technical and creative challenges, with Head Baker of Warrens Bakery, Jason Jobling, as Chief Judge. A full interview with Florrie follows – see below. It was a nail-biting day for all. First the finalists had to demonstrate their BAKING WIZARDRY by making a mystery recipe from scratch under the eagle eye of the judges. The recipe was for a three-strand plaited loaf, which required a light touch, breadmaking skills and maximum concentration. To everyone’s credit, the resulting loaves came out of the oven looking beautiful, and the National Catering Equipment Centre, which hosted the event, was filled with the homey smell of freshly baked bread for the rest of the day. Next came the PASTY CHALLENGE. Under the expert guidance of Jason, the finalists were required to crimp a Cornish pasty, and give it the professional finish that marks out a perfect pasty. As everyone soon discovered, there is much, much more to this than meets the eye, and the competitors were flabbergasted to learn that an experienced Warrens Bakery baker can accomplish three pasties a minute. ‘The trick is to use a light hand, but at the same time handle the dough firmly and confidently. It may take a few years, but you’ll get there in the end’ jested Jason. Although not quite up to Warrens’ standards, the youngsters all succeeded in turning out something that looked like a pasty, and Jason described their efforts as ‘highly creditable’. Third and last challenge was GET CREATIVE, which required the finalists to transform a sponge cake into the amazing centrepiece of a special occasion. They could choose a birthday, wedding, graduation or any other event, and Jason was looking for exciting flavours and skilful technique – but most of all, flair and personality. Florrie chose as her theme ‘Pride’ and her rainbow cake, festooned with flowers and other decorations, wowed the judges. Each finalist was awarded a signed copy of a book by celebrated author, Waitrose magazine columnist and rising baking star Martha Collison. But there could only be one winner, and last month Florrie Smith visited Cornwall to experience two of the most exciting days of her life. There to meet her was Jason Jobling, who has been with Warrens Bakery since the age of 12, when he took a holiday job sugaring American Ring Doughnuts. There are few people who know more about the craft of baking than Jason, and no one could be more generous in sharing his skill and knowledge. It is an exciting time for Warrens Bakery, which in early September won its own accolade, and scooped the UK’s No.1 Craft Bakery Business Award at The British Baker’s Baking Industry Awards. This is the biggest event in the baking calendar, and for Warrens to walk away with the coveted trophy was a huge honour. Look out also for Warrens on BBC1’s Saturday Kitchen this autumn – the show recently spent a day filming in St Just. While at the bakery, Florrie worked with Warrens’ creative team on some new baking ideas to put into development for the future. Obviously, the ideas themselves have to remain top secret for the time being, but one clue is that Florrie is vegetarian. Having long enjoyed the delicious vegetarian and vegan options already on offer at Warrens, it would be no surprise if the Young Budding Baker Of The Year had something original up her sleeve to extend that particular range. Florrie’s trip to Cornwall was over all too soon however there are more prizes to come. She and her family will be treated to a year’s supply of bakes, plus – most exciting of all – Florrie will undertake a baking course at a local cookery school worth £250. Q How did you hear about the competition? A It all started because I did a cake sale at my school, Portsmouth High School. The reason I did the sale was because I was raising money for a trip to Sri Lanka, to do voluntary work with orphanages and the disabled. One of our teachers, Kitty Price, bought a brownie and said it was the best she’d ever eaten. She decided to nominate me, and I was in Sri Lanka when I heard I’d got through to the finals. Q How did you get into baking? A My mum is an amazing cook, so we’ve always eaten really well at home. When I was 14, I started washing dishes in a local pub and now I work in the kitchen and prep – it’s the Victoria Inn in West Marden. We have a food tech department at school and that’s definitely inspired me and the other girls to cook. Everyone loves my coffee and walnut cake, and tiffin, and they’re gutted when I don’t make them. I’ve made them so much I don’t need the recipe any more – I like to vary things and experiment. The best thing is baking something, then seeing the reactions when I produce it. Q Were you nervous on the day? A A bit, because I didn’t know what to expect. But as soon I got there, everyone was so friendly and supportive. I relaxed, and soon we were all friends. It was fascinating working in a professional kitchen – I was impressed by the skill and precision that goes into the job, for instance measuring temperatures. Plus, after a few battles, I discovered my new favourite piece of equipment – the Kitchen Aid food mixer. Q How did you get on with crimping pasties? A I love eating pasties, and we go to Cornwall on holiday (my grandparents live in Launceston) but I’m not from Cornwall, so it’s not something I was brought up with. It’s hard to get the pastry the right thickness, and some looked good, some not so good. I will definitely do some more. I’m vegetarian, so if I see a vegetarian pasty, I want to try it. Cheese and onion is an obvious one, but Warrens’ Vegan Thai Pasty is definitely on my wish list. Q Where did you get the idea for your celebration cake? A I wanted to do something different, which people wouldn’t think of straight away. I knew it had been Pride in Brighton, so I decided to make a cake on that theme. I put jam in the middle, buttercream icing on top, and decorated it with multicoloured flowers to give a rainbow effect. I am more into cooking and baking than cake decorating, but I’d like to get good at it. I don’t think it’s something you can rush. Q Did you have any idea you might win? A It was all a bit unreal, the situation. I was away in Sri Lanka, then I had a week to prepare, and it was such a whirlwind I didn’t give a thought to winning or not. My least favourite bit of the day was waiting to hear the results. After the mad rush to get everything finished and presented on the display table, we had 40 minutes of agony waiting to hear the results. The other finalists were amazing, and we all had different strengths. We all enjoyed the day so much and learnt so many skills that it didn’t seem important who won. Q Any tips for other young bakers? A Baking is great for when you’re stressed. I get into the kitchen and put on some music. Oasis is good for baking – anything you can sing along to.